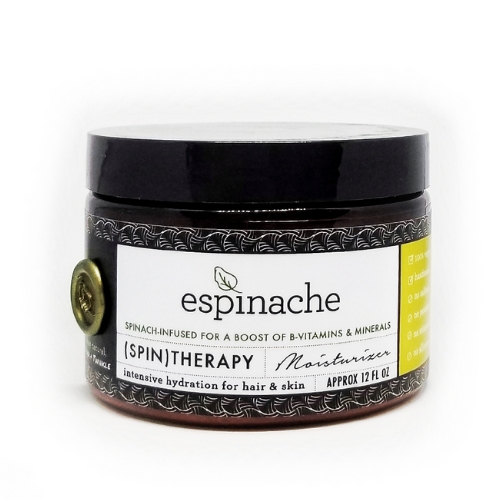 Espinache products are 100% vegan, handmade and infused with organic spinach for a natural boost of biotin, b-vitamins and minerals. Our highest purity standards of nature-made ingredients are what make our dual-purpose formulas so unique and effective. We're proud to be animal-cruelty free and free of sulfates, silicones, parabens and mineral oils. 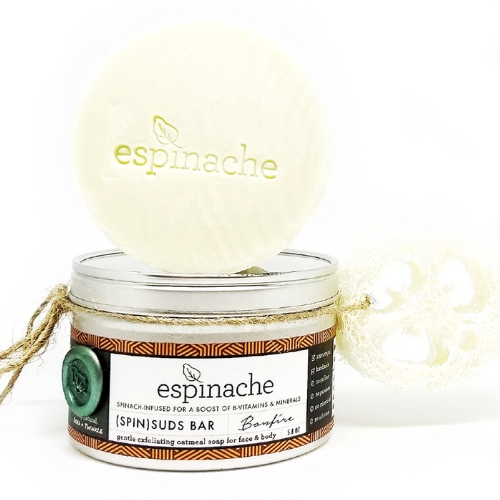 Philadelphia, PA — No matter your gender, age, skin or hair type, Espinache invites you to discover the natural and nourishing properties of organic spinach. 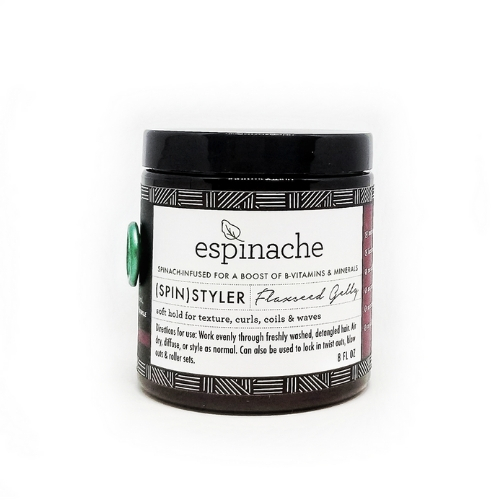 Formulated with a unique blend of potent botanical extracts and organic spinach, Espinache is a handmade and vegan cosmetic company newly launching its (SPIN)body collection. “We wanted to create an all-inclusive, affordable cosmetic line that is truly for everybody—this is why we opt for natural ingredients, steering clear of harsh chemicals and animal byproducts,” says Dora Sobze, Co-creator of Espinache. All Espinache products are 100% vegan, made with natural ingredients free of silicones, sulfates, parabens, and mineral oils. Scented with unisex fragrances, Espinache is formulated for both men and women. Many of the (SPIN)body products also offer multiuse functionality, providing nourishment and intensive moisture for both hair and skin—all in one! A veggie-based castile soap with a meadow-fresh scent combines the green forces of both the land and sea. The scent of energetic sea kelp balanced with earthy oakmoss, subtle citrus, and peppery undertones will leave you refreshed, invigorated and ready to conquer an all new day. 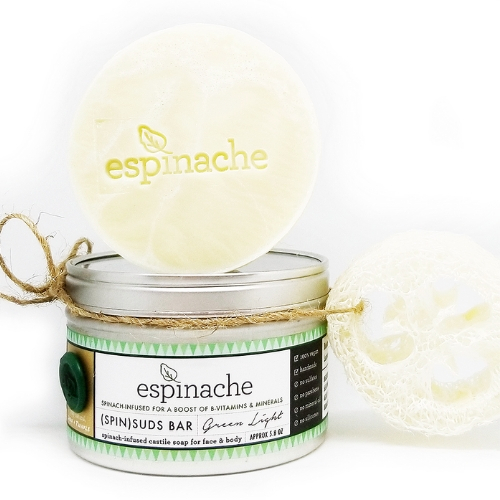 Each bar comes included with a reusable storage tin and natural mini exfoliating loofah. A gentle oatmeal soap with just a pinch of texture for light exfoliation, fortified with oatmeal and coconut milk to soothe and soften. Your skin will enjoy an all new clean that tickles your senses and spices up your mood with its musky combination of soothing lavender and earthy sandalwood. Each bar comes included with a reusable storage tin and natural mini exfoliating loofah. Our multiuse moisturizer doubles as both a leave-in hair conditioner and silky smooth body lotion. Infused with a botanical array of sage, rosemary, and sweet basil extracts that smooth, tone, tighten, and brighten. Your hair and skin will look, feel and smell as lush as a garden in bloom. Infused with pure handmade flaxseed gel, our soft-hold gelly enhances and smoothes styles and textures so your frizzies and flyaways won’t be flying any longer. Not quite a gel, yet not quite a cream, this flaxseed ‘gelly’ is not sticky, flakey or drying, adding shine and definition to every style while enhancing your natural texture. Horsetail leaf extract softens and repairs while meadowfoam seed oil adds slip and UV protection. Our one of a kind dry oil mimics the composition of sebum, the body’s natural oil and is so unique because it is silicone-free, meaning it won’t cause product build up. Combining the reparative yet lightweight forces of coconut, chia, and pumpkin seed oils for a trifecta of moisture and shine that is highly absorbent and dry to the touch. Your skin, hair & beard will be turning heads. Enjoy the infinite powers of coconut oil with an added boost of spinachy goodness. Our (spin)fuse coconut oil is the perfect sealant to lock in moisture, infusing organic unrefined coconut oil with coldpressed, virgin spinach seed oil. Free of fragrance and artificial coloring, its slight tint is from the rich, natural color of spinach seed oil. The new Espinache (Spin)body Collection was created by natural hair care and healthy living enthusiasts Dora Sobze and Twinkle Vakharia. Dora researched ethnic beauty standards and perceptions of natural hair care in her award winning academic thesis work at the University of Michigan. She realized that despite the emergence of more ethnic cosmetic lines, there are still deep divides between hair and skin types in natural and organic cosmetic spaces. Pace University graduate and Espinache Co-creator Twinkle Vakharia studied global marketing while abroad in Australia, where she further cultivated a sustainable lifestyle through vegetarianism and ecoconscious living. After returning to intern in New York City, Twinkle came to realize the unnatural standards reinforced by the American beauty industry. With diverse backgrounds in business marketing, psychology, and natural living, Dora and Twinkle joined forces to break the beauty barriers of race, gender and hair texture using the all-inclusive properties of spinach that are beneficial for everybody. Espinache products are hand-crafted in small batches and handmade in Morristown, NJ and Philadelphia, PA. “We want to take part in the ‘locavore’ movement and make a conscious effort to support both our local communities and small businesses nationwide—especially because we are one!” says Twinkle Vakharia, Co-creator. Dora and Twinkle have plans to continue supporting local communities via fundraising events and partnerships with local artists to feature and sell local artisan work through Espinache’s online boutique. Espinache also has plans to expand their product base in the near future with additional spinach-infused formulas to nourish hair and skin. The entire (SPIN)body collection, its accessories, and gifting bundles are available for purchase at the Espinache shop online at www.espinache.com. Individual product prices vary from $14-26 with bundle and gift set options also available and free shipping on all orders over $50. 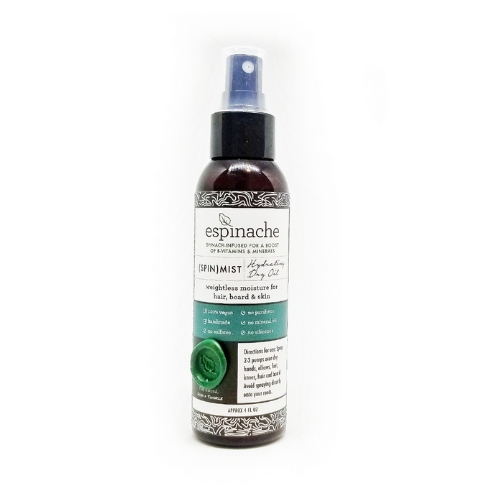 To discover your new, natural and spinach-infused regimen, visit Espinache online at www.espinache.com. 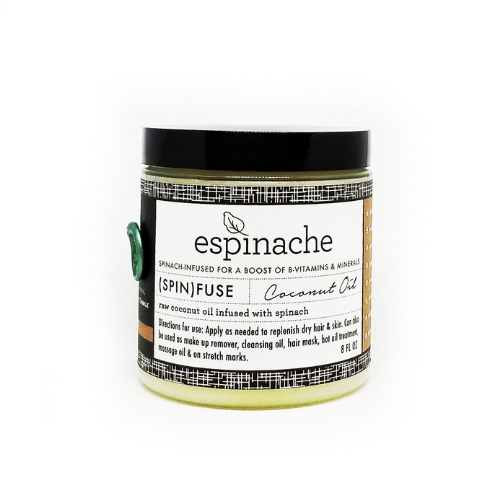 Espinache is the lovechild of a (healthy) obsession with spinach and an unruly passion for (natural) hair and skin care. We are a handmade, spinach-infused hair & skin care line that is truly for (every)body, made with unisex fragrances and formulas for all skin and hair types. Each of our products offers the benefits of vitamin and nutrient-rich spinach along with potent fortifying botanicals for a boost of moisture and replenishment. Many of our formulas are two-in-one, with multiuse benefits for hair and skin, so you can make the most of every ounce—and every inch of shelf space! Free of sulfates, silicones, parabens, and mineral oil. 100% vegan! Our two-in-one (Spin) Therapy doubles as both a leave-in daily moisturizer for natural hair and silky smooth lotion for body. Our unique formula provides intensive hydration without feeling overly greasy to the touch, thereby making it the best natural body moisturizer for dry skin and oily skin. Infused with a botanical array of sage, rosemary, and sweet basil extracts, your hair and skin will look, feel and smell as lush and fresh as a garden in bloom. There is no doubt it is the best all natural body moisturizer that also works to keep your hair soft, voluminous, and manageable. With its silky texture, (Spin) therapy is the perfect thirst quencher for dry, defeated hair and skin. Aloe Vera juice and avocado oil in this best daily moisturizer for natural hair work to plump up limp hair, and restore life to dry skin. Sage and rosemary essential oils in this best natural body lotion promote healthy blood circulation and help smooth, tone, and tighten. Inherent antibacterial properties of sweet basil essential oil help hair and skin stay fragrant and fresh while also brightening to combat graying and discoloration. A little goes a long way! Our soft hold (spin)styler flaxseed gelly enhances the natural texture of your hair while adding shine, definition, and pop. Not quite a gel, yet not quite a cream, our ‘gelly’ has a light hold that is not sticky, tacky nor flakey. Each batch is infused with a generous dose of pure handmade flaxseed gel that softens, strengthens and smooths your strands. Our soft hold gelly styles and moisturizes all at once so your flyaways won’t be flying any longer. Rich in omega 3 and vitamin E, flaxseed gel provides a soft hold with the added bonus of shielding hair, protecting against breakage, and promoting healthy hair growth. Our (spin)styler flaxseed gelly is fortified with horsetail leaf extract to soften and repair brittle hair, meadowfoam seed oil to add slip while protecting against harsh UV rays, and willow bark extract to condition and top off your style with radiance. Use (spin)styler as you would a traditional gel or styling cream—to set roller styles, to scrunch through wet hair, or to scrunch some life back into two or three day old curls and waves that need a lift. Organic Aloe Vera Leaf Juice, Horsetail Leaf Extract, Propanediol, Hydrogenated Olive Oil, Olive Oil, Olive Oil Unsaponifiables, Pro-Vitamin B5, Sclerotium Gum, Irish Moss, Jojoba Esters, Gluconolactone, Sodium Benzoate, Water, Flax Seeds, Coconut Oil, Organic Spinach, Spinach Seed Oil, Coconut Milk, Guar Gum, Willow Bark Extract, Meadowfoam Seed Oil, Apricot Kernel Oil, Fragrance. Enjoy the infinite powers of coconut oil with an added boost of spinachy goodness. Our (spin)fuse coconut oil is the perfect sealant to lock in moisture, infusing organic unrefined coconut oil with cold-pressed, virgin spinach seed oil. Free of fragrance and artificial coloring, its slight tint is from the rich, natural color of spinach seed oil. Our (spin)fuse coconut oil has a multitude of benefits for hair and skin. The conditioning, detangling and antibacterial properties of coconut oil paired with the vitamins, minerals and fatty acids of spinach create a powerhouse duo for hair and skin. Vitamins A, B, and C strengthen and protect while promoting the body’s production of collagen, improving elasticity, and encouraging the growth and renewal of hair and skin cells. Magnesium and zinc found naturally in spinach help combat early signs of aging, shielding the skin and hair from sun damage, and can help reduce the appearance of wrinkles and soothe inflammation. Our unique spinach infused coconut oil makes for a gentle make up remover, cleansing oil, hair mask, hot oil treatment, massage oil, intensive care for stretch marks, and all-purpose moisturizer for hair and skin. Renew and replenish lackluster hair and skin back to vibrancy with our one of a kind, silicone-free hydrating dry oil for dry hair, dry skin, curls, and beard oil. It is the best spinach seed oil product formulated for skin and hair care. Infused with organic spinach, our lightweight formula combines the forces of coconut, chia seed and pumpkin seed oils for a unique trifecta of moisture & shine that is dry to the touch. Your skin, hair & beard will be turning heads. (Spin)mist was created by us for you to mimic the composition and quality of sebum, your body’s natural oil that lubricates and moisturizes skin, hair and beard. (Spin)mist is unlike other dry oils on the market because it is silicone free! Meaning it is safe to use on both skin and hair without causing buildup or clogging pores. Our dry oil is exceptionally light and highly absorbent so your skin and hair will soak up the good stuff without feeling greasy or waxy. Pumpkin and chia seed oils provide a rich dosage of omega fatty acids, vitamin E, and anti-inflammatory properties while coconut and apricot kernel oils seal in moisture with life-affirming properties that firm and tone. Available in standard & travel sized! Feel fresh, clean, invigorated and ready to conquer an all new day with every scrub. Green Light is a meadow fresh scent combining the green forces of both the land and sea. Your senses will be awakened with the energetic scent of sea kelp, balanced with earthy oakmoss and subtle citrus. Each gentle lather (spin)suds bar is handmade with spinach seed oil, organic Jersey-grown spinach, and silky coconut milk that soften and shield. Your hands and skin will be fortified with vitamins, nutrients, fatty acids and antioxidants found naturally in spinach. Each bar comes fully equipped with a reusable storage tin and natural mini loofah to exfoliate and smooth roughness. Extra Virgin Olive Oil, Palm Oil, Coconut Oil, Safflower Oil, Glycerine, Water, Sodium Hydroxide (Saponifying Agent), Sorbitol, Sorbitan Oleate, Oat Protein, Titanium Dioxide, Organic Spinach, Coconut Milk, Guar Gum, Spinach Seed Oil, Fragrance. Our gentle exfoliating oatmeal soap pairs our sultry bonfire scent with just a pinch of texture for light exfoliation. Naturally fortified with soothing oatmeal, your skin will flaunt an all new clean that tickles your senses. Its musky fragrance of soothing lavender and earthy sandalwood will spice up your mood. Each gentle lather (spin)suds bar is handmade with spinach seed oil, Jersey-grown organic spinach and silky coconut milk that soften and shield. Hands and skin will be fortified with vitamins, nutrients, fatty acids and antioxidants found naturally in spinach. Each bar comes fully equipped with a reusable storage tin and natural loofah to exfoliate and smooth roughness.